A wedding is a costly business and the price can soon mount up, but by adding a personal touch you can save yourself some money. There are so many parts of the wedding that you can add that personal touch to. You could try handwriting all your invitations but if you are inviting a lot of guests then it might be best to design and print them using a computer. Although the ink and paper may cost it wouldn't cost nearly as much as having an invitation professionally designed. A nice touch is to roll the invitations into scrolls and secure with a ribbon. If you do want to hand write your invitations then make sure you have a very good pen. Try a fountain pen for beautiful calligraphy pen. Cut flowers are easily bought from florists and online from wholesalers. 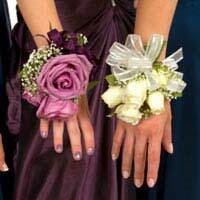 Lilies and roses are the popular choices for corsages. They can be pinned on with a corsage pin or tied onto the wrist with ribbon or elastic. Take a look online for tutorials, it's very simple to attach a single flower and some foliage to a wrist band for an attractive looking corsage. Make these close to the wedding day and keep them in the fridge to keep them crisp and fresh. Handmade photo albums can be hugely personal and you get to be fully involved with the photographs after they've been taken. Professional albums can cost hundreds of pounds but there are various tutorials online showing you to hand-bind beautiful, fat albums. For another personal touch you can forego the photographer completely and instead get your guests to take the pictures. You can either pop disposable cameras on the tables during the reception or you can appeal to guests to take as many pictures on their own digital cameras as possible. And then to send you the results! You can take old jewellery and turn it into something spectacular and new. Head to charity shops and vintage stores to find cheap costume jewellery. You can create amazing pieces by combining two pieces. Go for silver or gold chains with reclaimed pendants and charms from costume jewellery. It's relatively easy to make silk or paper flowers for your wedding. The upside to these over real flowers is that they can last forever. For silk flowers start by finding some pictures of flowers you like. Not down the petal and flower shapes. Then draw out the petal shapes on the back of a piece of silk which will co ordinate with your wedding colours. When you have a nice range of petals you can sew them together then attach to a piece of wire. For fuller flowers you can stuff between the petals with small pieces of cotton wool. Secure the flowers together to make a bouquet.